Hark, the call: It seems like everything’s finally settled down, fifty years into the twentieth century. War is over. The economy’s booming. People are on a long exodus from the city. It’s all settling. Perhaps things are not as settled as they feel. . . So the job was to recall the 1950s with an occult flavor, the anthology to be called SOCKHOPS AND SEANCES. Reprints would be okay. It just so happened I had a story, “Bottles,” originally published in CROSSINGS (Double Dragon 2004; also reprinted in THE TEARS OF ISIS), set in 1958 Cambridge Massachusetts. Historical accuracy would be insisted on (I lived in Cambridge from late 1959 to mid-1964). But also with vampires, perhaps a bit chancy, or at least someone who believed in vampires combined with a period fear of Communism. Still, why not, thought I? And so today, May 1, International Labor Day, the reply came back from Editor Nicole Petit of publisher 18th Wall Productions: Thank you so much for your submission and your patience as I deliberated on the stories sent in for SOCKHOPS AND SEANCES. I am excited to tell you that we will be accepting “Bottles” into the anthology. More to appear here as it becomes known. Today brings some of the ancillary aspects of writing, the major bit being to go over proof sheets from CEMETERY RIOTS for “The Re-Possessed” (cf. May 5, et al. ), my tale of the business side of Victorian funerals. First, to be sure, one must find an honest undertaker — but then the bereaved must be certain that he is honest himself as well. If things stay on schedule the book is expected later this month, so corrections, if any, should go back tonight. Then, unrelated, an acceptance and contract came today, the latter of which must be read over, signed, and popped into the mail tomorrow. For what, one may ask? But here’s the odd part. That must be a secret, at least for a few days in deference to other writers who may still be awaiting word. Which is fair enough. So stay tuned and, in time, all will be revealed. And then, speaking of timetables, I now have an expected release date for “Bubba Claus Conquers the Martians” and Upper Rubber Boots Books’s THE MUSEUM OF ALL THINGS AWESOME AND THAT GO BOOM (cf. March 17, et al.). “Bubba Claus,” of course, is a Christmas story — in this case one that also has zombies — and so, for visions of sleighs and snow (or at least a space shuttle) in the height of summer, it’s slated for publication next month on July 26. 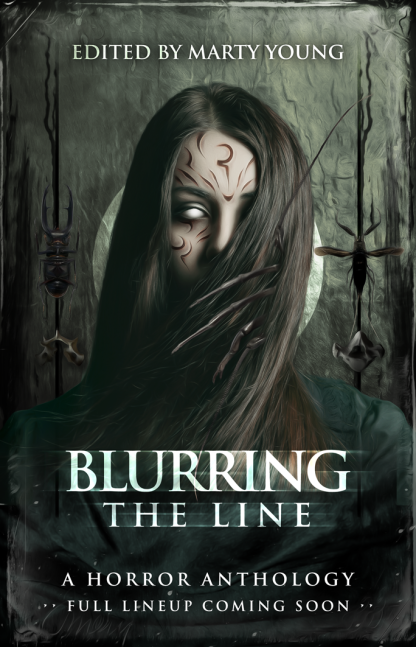 Today’s email brought an update from Cohesion Press for BLURRING THE LINE (cf. March 23, February 7), the Australian anthology that asks the question: “Do you really know what’s real and what isn’t?” According to Editor Marty Young, “[r]eal life kind of got in the way for a few months,” but no w it’s on schedule for publication September or October this year. And, as another nod to real life, the book will be dedicated to recently passed on, on July 11, author and four-time Stoker Award® winner Tom Piccirilli, “who contributed with a pretty hard hitting story that’s incredibly close to home.” Also the table of contents should be finalized soon, and will be announced here as soon as I know it. My part here is called “The Good Work,” a treatise on witchcraft in 1850s London. Or is that witch-hunting? And, along with a call for updated author bios and pictures, there will also be a limited hardcover edition signed by the authors, more on which will be announced as well as details become known.